Did you know shag carpets come with rakes? 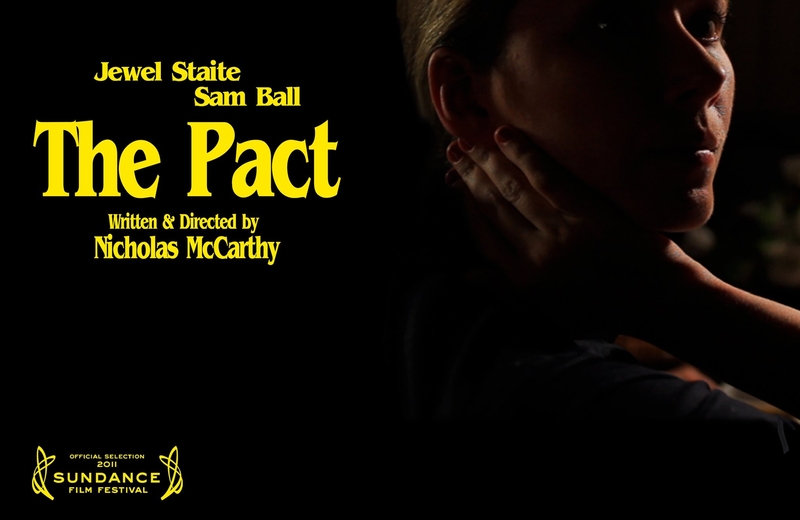 Director Nicholas McCarthy and his short film, THE PACT, is a riveting and suspenseful tale of the horrors of one’s past. His film will be at this year’s DALLAS International Film Festival which runs from March 31st – April10, 2011. Nicholas responded to an in-depth questionnaire about his film career, his tremendous actors, and he’ll enlighten you on that whole Shag Carpet question. 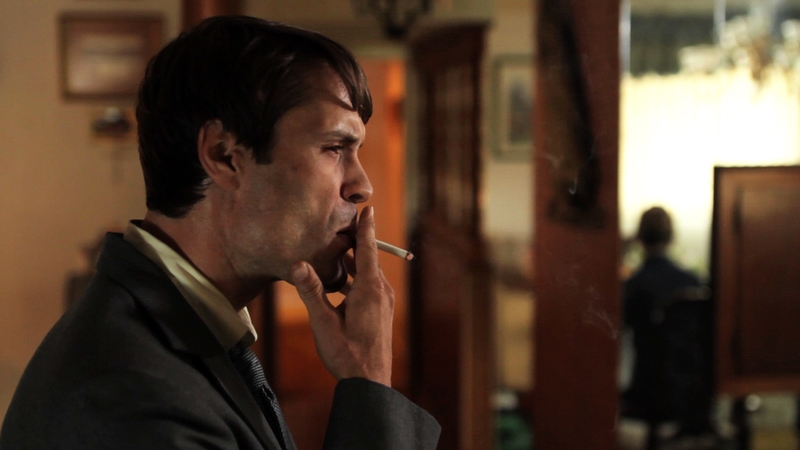 The DALLAS IFF Bound Nicholas McCarthy answers our Questionnaire. 1. I always like to ask where you’re from and what was your first experiences with the arts/film? I grew up in New Hampshire. When I was 10 my family moved to Boston, and there was an incredible revival film scene thriving in that city then. I had already become obsessed with movies as a child and was making them on Super 8mm, but having the opportunity to actually go and see all sorts of classic films on a giant screen was an incredible privilege. The first movie I saw after we moved I snuck off to by myself — Herzog’s NOSFERATU. I don’t know what I thought of it at the time. 2. You’re a member of the “Purchase Mafia” aka you went to SUNY Purchase College. What was it like being there and what projects did you work on while there? Purchase is a great, small film school that emphasizes independent filmmaking. They give you many opportunities to make films, and when I was there I made project after project. One of my professors was Hal Hartley, and I think Hal embodies a lot of the spirit of that program — it’s very much about the art film vs. the commercial world. 3. When did you make the jump out to LA and what was it like in those early days? I moved to LA in 2000. I was visiting my sister here and saw a painting of the Frankenstein monster on a bus stop bench advertisement for the Hollywood Wax Museum. Suddenly it hit me that here was the history of this city — the movies. I fell in love immediately. 6. In 2004 you wrote and directed (and composed!?) your first short film, MAID. Actually co-directed with Sam Zuckerman, what has your work history with Sam been like? Where did this project idea come from and it’s labeled as a “Korean Musical” which means what exactly? Also I noticed the film’s languages are English, Spanish and Korean, what was it like writing a script with such variance in culture and language? MAID was actually the 12th short film I made in a film club I had started with some friends called Alpha 60. But it was the first I played at a film festival (the late, great CineVegas) so it was sort of my “first” movie to the world. The films I was making in that club, which was a loose-knit project based out of a not for profit called the Echo Park Film Center, were fairly experimental and made for no money. MAID was no exception and it’s probably still the strangest film I’ve ever made. I conceived of it with my friend Sam, who I’d known for many years — we wanted to start something as a Spanish language documentary, have it change into a straight narrative, then change again into a Korean musical. We actually wrote a song in English that our actress translated into Korean and lip-synched that way for the camera. I’m not sure if anyone understood what the hell we were doing and I’ll never forget watching it with an audience of strangers at the festival in Las Vegas. At the end there was silence, and then very polite, but obviously baffled applause. A couple of people liked it, but someone blogged that it was the worst movie they had seen that year. On a list of like 100 films, my 6 minute short came in last after WHITE CHICKS. 7. Cry for Help was your first time making it out to Sundance (amongst other festivals as well). This film has one of the craziest plot lines i’ve ever seen – what the heck is, “A malcontent teen, an addled hippie throwback, beef jerky, and circumcision: the inside story of the Rapture.”, this film about? Also you had a writing partner on the film, Charlie Short, what was your writing relationship like? Well you just described the movie! That’s actually what it’s about. CRY FOR HELP began as a writing collaboration with a friend of mine, Charlie Short. We had developed this weird comedy idea for years and finally decided to make it as an epic short film. It was very ambitious. My now-wife Alex Lisee produced it, and it was the first time I worked with a legitimate crew and actors, and dealt with things like special effects and shooting on a schedule. It took a year of my life from raising the budget to finishing. I can’t watch the movie anymore, but it was important for me to make because it opened me up to a lot of the responsibilities of being a director. 8. Looking at the cast for the film. What was it like working with Scrubs’ Sam Lloyd, up-and-coming actor Bo Barrett and vet Mel Rodriguez? Mel I went to college with and he’s a terrific guy and great actor. Bo Barrett we found in auditions and he totally captured his part, the sullen teen. Sam Lloyd was a bizarre and fun choice for our lead, a nervous hippie who accidentally kills one of his customers. I love Sam. We actually had a few SCRUBS alumni on the crew, a great bunch of people who my DP Charles Papert generously introduced us to. 9. What was the Sundance experience like in 05′? Like going to camp — the first few days you’re confused and scared and don’t know how anything works. By the end you’ve figured it all out and are going to parties, looking forward to your screenings and meeting lots of people. It was great. 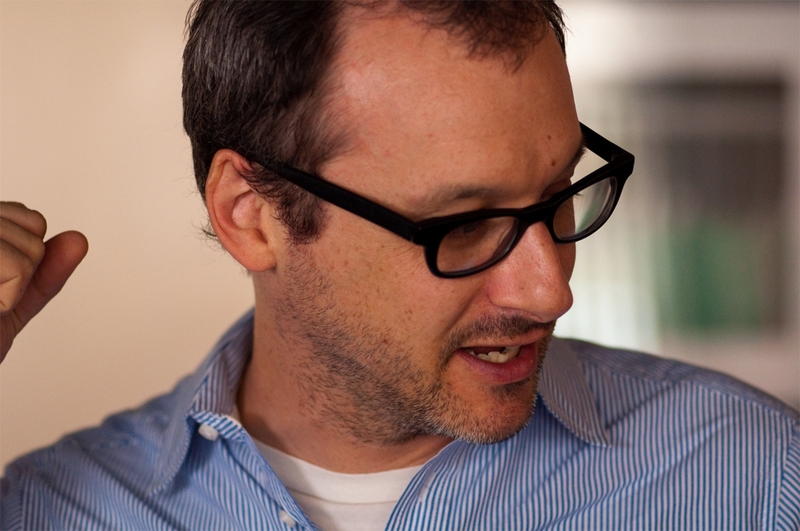 10. Who is Mike Plante and what is LUNCHFILM? And obviously what is the connection to your next short film, Chinese Box? Mike was the Sundance programmer who sort of turned into my advocate after seeing my early films. He always pushed me to keep making stuff. He started doing this thing called LunchFilms, where he would take filmmakers he liked out to lunch and in exchange they were supposed to make a film for him for the equivalent price of the lunch. The idea was to get people to make these sort of film equivalents of B-sides, little things that didn’t cost anything and were done quickly. He asked a lot of great directors to do those movies so I felt honored to be in that company — Nina Menkes, Martha Colburn, George Kuchar, Bobcat Goldwait. I made CHINESE BOX for the program, which ended up touring all over. 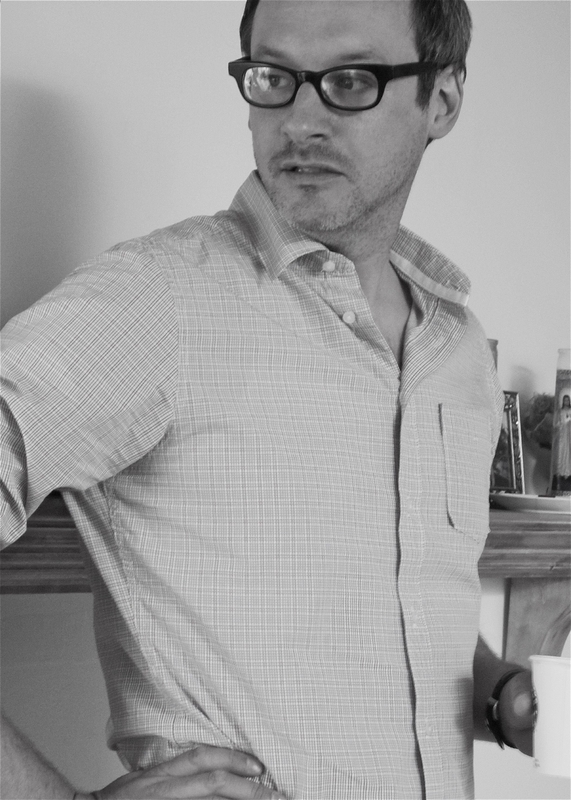 Nicholas McCarthy on set of Chinese Box. 11. Chinese Box seems like a drastic departure from Cry For Help. In the sense of scale, this project seems more low-budget and intimate. What was it like working on such a different project and after a pretty lengthy time off from Cry For Help? Also will you talk about your two leads in the short, Sam Ball and Petra Wright? I had been working as a screenwriter and trying to get a few different features off the ground in the years since CRY FOR HELP, so when Mike asked me to make another movie I realized it was a chance to do something outside of how I had been thinking. The movie turned into a personal challenge for me. I decided to pare everything back to essentials, to see if I could make a film about two actors in a single location interesting. It’s a simple film, and designed to sort of throw an audience for a loop if they’re paying attention. I think I succeeded with it, and it gave me a new confidence. 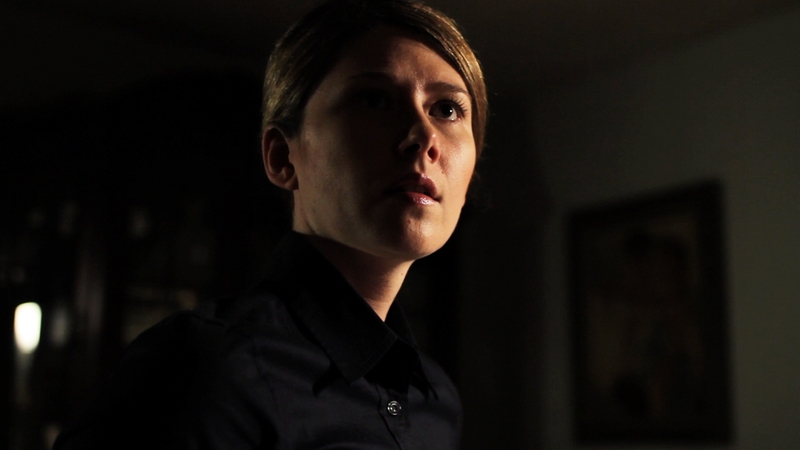 My actors, Sam and Petra, were simply phenomenal. They carry the entire film. Sam Ball still from The Pact. 12. What was the festival circuit like for a more intimate movie like Chinese Box? It played in the LunchFilm program as a sidebar at Sundance, and it also played at the AFI Fest in LA. There were a lot of other screenings all over. You don’t get as much attention because it’s a odd little program of films, but the times I’ve watched the movie with an audience I’ve loved it. I just saw it again in Tucson a few months ago. 13. Sam obviously worked on you with Chinese Box, but how did you get Jewel Staite. Most folks recognize her from Firefly/Serenity, but I remember her from way back in the 90’s with a show called Flash Forward. How did you first come to know of her and talk about the casting process? Jewel was recommended to me by a mutual friend. I had actually never seen her stuff and after my friend offered to send her the script I had the experience of googling her on youtube and looking through page after page of fan videos from sci-fi conventions until I got to a clip of her actually acting! When I finally found that footage of her work I realized that she was a terrific actress, and also one that hadn’t really done a role like the one I had written. When I met her I knew right away that she would be great. There’s such a difference working with someone who as much experience and confidence as Jewel has. She made everything so easy. She’s truly a star in this little movie. 14. The film has two vastly differently siblings going through the home of their recently passed away mother, what was the inspiration for these two siblings? Also I was really impressed with how much information about their beliefs you got into the early part of the story, what elements did you want to highlight with your script? The ghost stuff I wanted to set up in the second half of the film informed the characters in the first. The brother character functions as a devil’s advocate to Jewel — he questions everything she believes in. And since she’s the believer, it felt right to have her be someone with a more rigid sense of right and wrong, a very different kind of person than he was, more tightly wound. The movie is about her threatening to unravel because of what she says she believes in. I guess it’s sort of a theme with my stuff. 15. The horror elements of the film are done quite well. Its not a scare you with a big “BOO” its a very subtle and eerie feeling you have throughout. Some of the elements that stood out were the subtle glances by Jewel’s character, the quiet feeling throughout, the yellow carpet of the rooms, the mixture of catholic symbols and kids pictures and also the violin/piano music that really grips you. What were your goals in terms of capturing the horror elements of your film? What filmmakers or films inspired you in the way you tell a subtle ghost tale? I love it when non-horror movies employ motifs you find in horror. And I like it when films take left turns. For this movie I had this idea to take a kind of character piece and slowly move it into the genre, to take people by surprise. When I was writing I had been thinking about the horror movies Val Lewton made in the 40s, which have a very literary style — they’re all about the writing and characters on top of these great suspense set pieces. The end of THE PACT is an homage to the scenes in Lewton’s movies where his characters walk through dark spaces all alone. Visually I was inspired by moments in Dario Argento’s movies, particularly FOUR FLIES ON GREY VELVET and SUSPIRIA. The spirit of Argento’s classic films, where the camera can sort of wander away down corridors, was what I was going for. 16. Speaking of Music in the film, i’m a huge fan of The Airborne Toxic Event. What was it like working with Ronen as a composer and did he bring Anna on-board or was that your idea. Also having Dan on board with his jazz piano really was quite amazing. How much did they bring to the overall feeling of your film? Ronen is a great composer, exacting and incredibly gifted. I was interested in meeting with him originally because his background was in chamber music and that felt like the right reference for the film. It turned out one of his influences was the same composer we had used for the temp music in our rough cut, Krzysztof Penderecki. Ronen and I wanted the most organic, “real” instrument sound we could get, and he knew Anna and Dan. Anna recorded her part in Ronen’s apartment, while Dan recorded his by remote in his New York studio. It was amazing hearing the mixes once their parts had been dropped in. There’s simply no replacing a real player with a machine, especially ones as good as they are. 17. We love to highlight DPs and Cinematographers at PSD, mainly because i’m fascinated by the way they truly capture emotion with just images. You’ve worked with one hell of a DP in Bridger Nielson, what has it been like working with him? 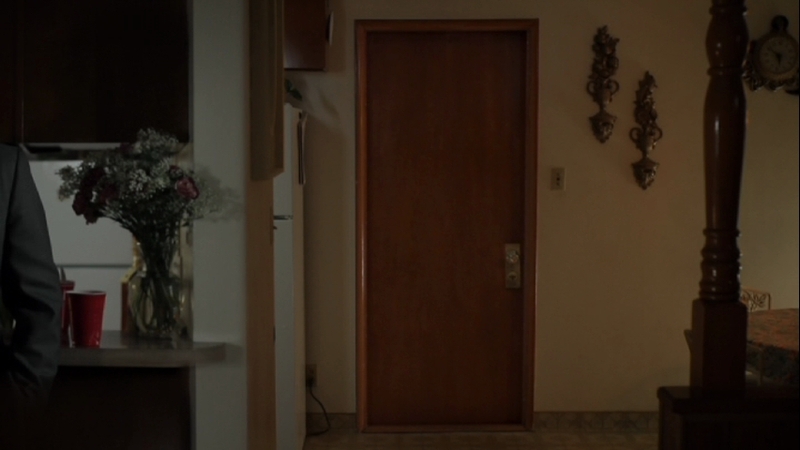 Specifically I really enjoyed the way the camera moves towards the door to the basement, almost tilting to far to the left and right before becoming a tight stable shot of that haunting door that obviously effects the siblings so much. What shots are your favorite in the film? Bridger’s work speaks for itself, the movie looks amazing. We’ve known each other for a while and working with him is a joy. We share a sensibility. Our working process is fairly simple. I told him my ideas for the feel of the movie, then we sat and watched some scenes from films that I thought were good reference. BLOW-UP was one of them, the famous scene in the park when David Hemmings is taking pictures. Then I storyboarded the whole film and we discussed each shot. When it came time to shoot I had to tell him very little, maybe just to get a few feet closer or swap a lens. But his instinct was always dead on. The shot of the door you’re talking about is a move done by our Steadicam operator on the movie, Brian Freesh. What gives it an odd quality is it’s being run in reverse, we actually started with the door handle and pulled back. The shot that people seem to get the most nervous at is another Steadicam shot, when Jewel is holding the laptop in the hall and the baby appears on it. It’s an unusual composition because you have the frame drifting around from the floating Steadicam mount, there’s this laptop screen inside the frame with its own distorted image, and in the background this long hallway with an open door you can see into. There are so many places for your eye to go that the sum total is really unnerving. 18. In Pact the actual design and views of the home are quite amazing and filled with little subtle pictures and toys. How did you and Walter come about capturing your vision of this place? I met Walter right after I found that house, and one of the first things I said to him was “Your job just got a lot easier.” Much of the set design people probably remember from the film was stuff that already existed in that house, like the Virgin Mary shrine, which was exactly how we found it. The family that lives there and graciously let us shoot for two days is very Catholic and hadn’t really changed the decor of their place since the 1970s. It was an incredible house just to walk around in. Walter brought in a lot to augment and create this sort of additional layer of life to it, but he also moved a lot of things around that were already there to get them in the frame. I’ll never forget Walter raking the shag carpet when we were doing our close-up of it. He gave everyone a little dissertation on the history of shag carpets. Did you know they came with rakes to clean them? 19. What was the Sundance Experience like the third time around? The short was well received. I couldn’t believe how many people told me they were scared by it. It really took me by surprise. You know, you live with something for so long and then finally have the experience of an audience reacting to it, it was easy for me to forget that my intuition all along was to make something that was frightening. I’m sure not everyone has this reaction, but there were more then a few people who told me they hid their eyes. What’s wild is… nothing really ever happens in the movie. Like any ghost story, its what those being told it are reading into the events depicted. To me the movie was always about Jewel’s character. But as it plays out, people are like — oh no, look out for the ghost! 20. Is this a project that you see as something that could be expanded into a feature film? It will be a feature film, right now it’s not clear exactly in what form. But I hope to be shooting it in the summer. Here is the trailer to Nick’s movie.